Flowers make cute dorm room decorations for girl's dorm rooms. This Hollyhocks - Peel N Stick lets you add colorful and awesome flower power to your college dorm room. You can put your Hollyhocks anywhere, and you can move them around from wall to wall. The Hollyhocks - Peel N Stick is both removable and re-positionable. 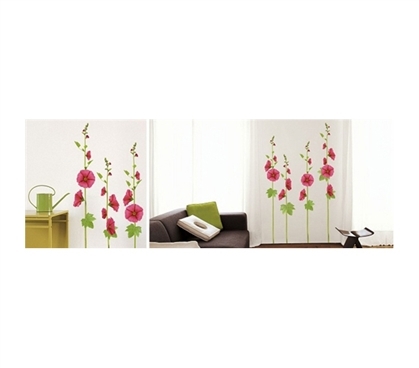 With the Hollyhocks - Peel N Stick, you get dorm room decor flexibility. 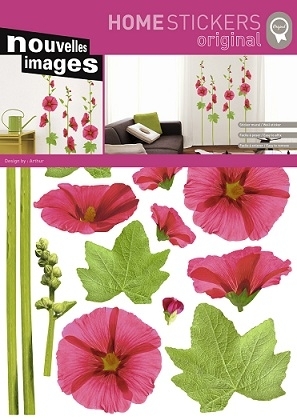 Use Hollyhocks - Peel N Stick to add a fun feeling to your dorm room. Flowers may be simple, but they do the trick when it comes to accenting dorm room walls. These Hollyhocks - Peel N Stick flowers are sweet, colorful, and best of all, easy to use for any college student. Without having to worry about messes and damaging your dorm room walls, you can have fun adding all kinds of Peel N' Stick decorations to your college dorm room.